From the book jacket: Roger Torraway watched in horror as the monster lurched, toppled over and died. Project Man Plus had gone suddenly and drastically wrong. The race to colonize Mars was too important, too costly, and America was already too committed, for plans to be scrapped. They would have to make a new Martian. And Roger Torraway was it, candidate for the endless surgery, operation after painful operation, that would enable him to survive on that faraway planet. Man Plus is a thrilling race against time-to land on Mars on schedule, to insure that Roger's system will withstand the stress that killed the previous candidate. 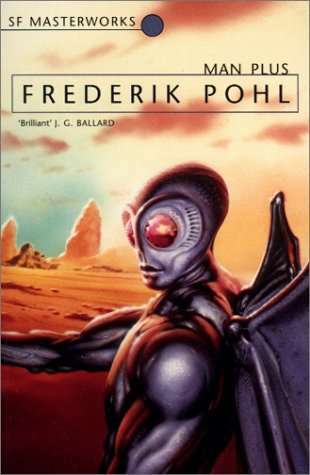 And, meanwhile, somewhere, somehow, there has been a breakdown in the computer network ... With edge-of-the-chair excitement and suspense, four-time Hugo Award winner Frederik Pohl tells the story of the remaking of man into Man Plus, creating in Roger an unforgettable character, grotesque in appearance but totally human in feeling-capable of yearning, depression, love, jealousy, terror. Man Plus is so superbly well done that it will appeal not only to science-fiction fans but to readers of such novels as The Andromeda Strain.